For your book to live, you must start writing. One obstacle can stop you from writing your book. The biggest obstacle to the creation of their book most would-be writers face is procrastination. If you sit and think about your book, talk about how someday you’re going to write a book, but never ever take that first step of writing something down, that idea will rattle around in your head and eventually your unborn book will perish. For your dream to become a book, you must record it. In every field, there are people with grand dreams. For business people, it’s the business they’re going to start someday. For musicians, it is that song they want to write. For people with financial problems, it is the change they’re going to make eventually but never do. People with an addiction are always telling themselves they will quit someday. For writers, it’s always those ideas floating around in their head that never become a reality. What stops all these grand visions from becoming a reality is failing to take that first step and transforming those thoughts into something tangible. No matter how fabulous your idea for a book is, you will never give birth to that creation until you begin recording your thoughts. The mechanics of how we record thoughts has changed over the millennium. The earliest writings were probably chiseled in the stone, pressed into bricks or painted on ceramics. For several thousand years now writing meant recording something with a stylist, a pen or pencil, on paper or its equivalent. 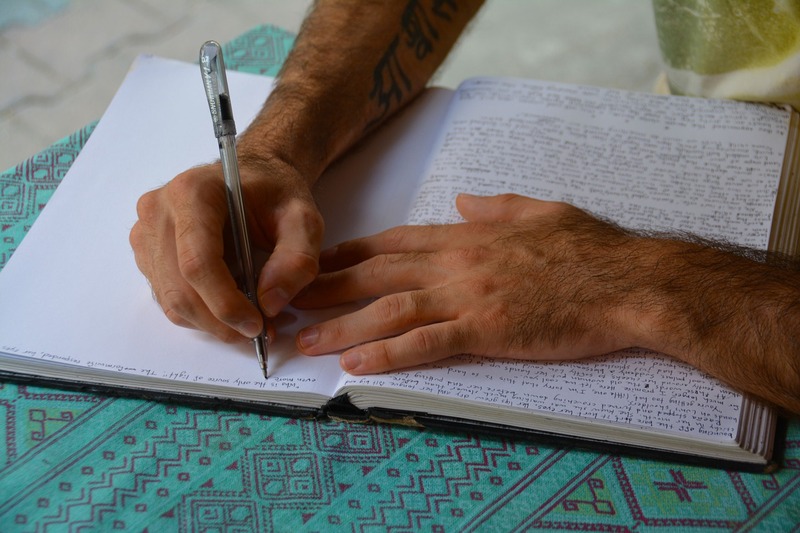 Today writers have the option of typing on a computer, recording their thoughts on an electronic medium, or dictating, and many other possibilities besides writing directly onto paper. The one thing that hasn’t changed is that it’s not a writing until someone acts and records what they are thinking. Writing a book requires a commitment. Your book begins when you write the first page. It’s possible that your first page will be discarded or revised so much that you will not recognize it. But you can’t write the second page until you’ve written the first. For me the years of wanting to write produced nothing. What shifted me from wishing to having written, was putting down a date on my calendar when I would begin. This year will be my fourth year entering NaNoWriMo. Making the commitment to start writing on November 1 and to continue to write all the way to the end of November results in substantial progress in transforming my ideas into something written. What results in the finished work is what happens between the end of November and the following year when I start a new project. Lots of things get in the way of starting your book. The list of reasons why you haven’t begun to write yet is almost infinite. We each have excuses we give ourselves for why we haven’t started that book we want to write. While the excuses are many, the solution is singular. If you want to write or create something else, you must start the process of transforming those ideas in your head into something tangible. Write out your business plan. Draw a sketch of the finished project. Humans are not born as adults, full-grown and full-sized. It’s not likely that someday you’ll sit down and, in a few hours, type out that book. What is certain is that nothing will happen until you write that first page. What separates the 10% of people who begin to write a book from the 90% who plan to write a book someday but never do is the simple step of beginning to write. Is today the day to begin to write your book? Which day on your calendar have you selected as the day that you will start transforming your daydreams into realities? Today I talked to you about the largest obstacle that prevents potential writers from ever starting that book, next week on my writing Wednesday post, let’s talk about the second obstacle you will face in transforming your idea into a finished book. This entry was posted in Writing and tagged blogging, counselorssoapbox.com blog, David Joel Miller writer, publishing a book, storytelling, Writing, writing a novel, Writing ideas, writing Wednesdays by David Joel Miller. Bookmark the permalink.